Yet another recipe that I found on Pinterest. Chicken and cheese, what is not to love? This was easy to make and so delicious. The original recipe can be found here. There are great step by step photos. I made a small change in advance. I bought cream of chicken soup with herbs. I was in a hurry at the grocery store and that is what I found. This meal came out so delicious! I will be making this again! I used three chicken breasts. Next time I will cut the amount of cheese down to 2 cups and the Ritz crackers to one sleeve as I had a bit of leftovers. If you cut the chicken into smaller chunks I think this would make a great appetizer. Grind up the Ritz crackers in a food processor. Put the salt and pepper into the cracker crumbs and stir the mixture to combine. Dip each piece of the chicken into the milk and then into the cheese. Next put the chicken into the cracker crumbs and press it in. Lay the chicken into the baking pan. In a small or medium sized pot combine the cream of chicken soup, sour cream, and butter with a whisk. Stir it over medium high heat until the sauce is hot. Serve the sauce over the chicken and enjoy a fabulous meal! 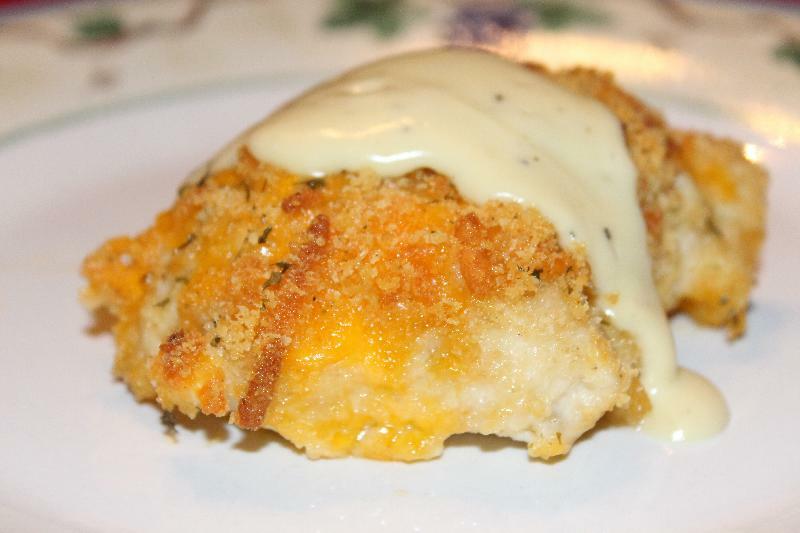 Description: a crunchy and cheesy way to eat chicken!